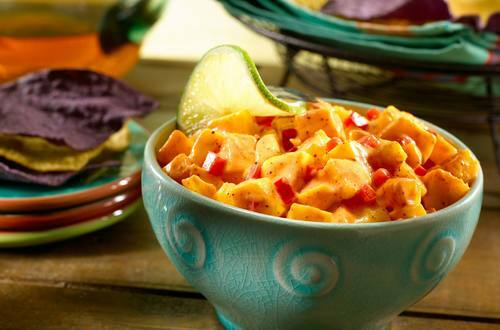 1 Combine sauce, Hellmann's® or Best Foods® Light Mayonnaise and chili powder in large bowl. Stir in mango and red pepper. Serve, if desired, with tortilla chips. *SUBSTITUTIONS: Use 1 package (10 oz.) frozen mango, thawed and chopped, instead of fresh mango. Also, try using regular chili powder instead of chipotle chili powder.